The term "ecosystem services" is defined as the set of goods and services that human societies obtain, directly or indirectly, from ecosystems. They are classified as support services (primary production, nutrient cycling, soil formation, etc. ); regulation (climate regulation, air purification, flood control, quality and quantity of water, disease control, etc. ); supply (food, wood, fiber, fuel, etc. ); and cultural (recreation, tourism, spiritual, educational). The 8th SARAS 2018 Public Conference is co-organized by CURE-Udelar, Stockholm University, Stockholm Resilience Center (SRC), and the PECS Program. 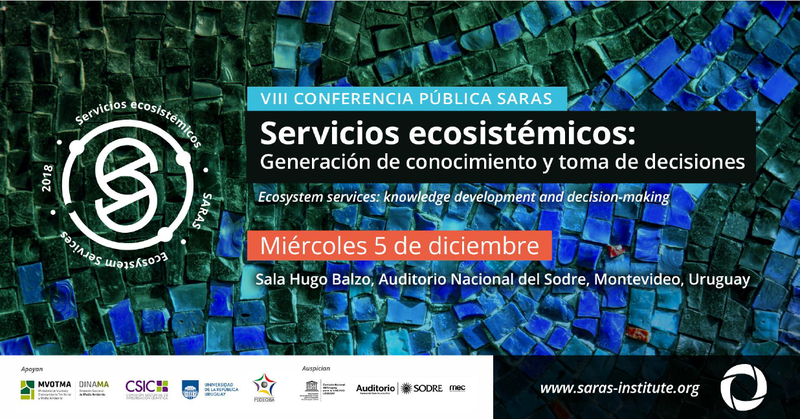 The conference entitled "Ecosystem services: knowledge creation and decision making" will be the main academic event on the conservation and use of ecosystem goods and services developed by the SARAS Institute in 2018. It will be held on December 5, from 1:30 pm to 8:00 pm at the SODRE National Auditorium, Hugo Balzo Room, Montevideo. This activity is accessible to the general public free of charge, with pre-registration completed by November 20. The activity will bring together the academic sector, civil society organizations, students, decision makers and the general public, with the aim of analyzing and sharing key aspects regarding the understanding and management of ecosystem services sustainability in the region. There will be presentations delivered by internationally renowned speakers with outstanding academic background and contributions to management, governance and conservation of aquatic resources, biodiversity, forests, oceans and fisheries. The opening presentation will be given by Patricia Balvaner, professor at the Ecosystems and Sustainability Research Institute of the National Autonomous University of Mexico, Director of the Global Monitoring Program on Ecosystem Services, and Vice President of the Scientific Committee of the Programme on Ecosystem Change and Society (PECS), a global research project of Future Earth, that seeks to generate knowledge on the environmental and human aspects of global change and find solutions for sustainable development. Her line of research ranges from the study of the functions of secondary tropical forests to the assessment of ecosystem services in the context of socio-ecological systems (natural and human systems in permanent interaction). Balvanera is also a member of the Advisory Board of SARAS since 2017. There will also be presentations delivered by Matilda Baraibar (Stockholm University, Sweden - Member of the Advisory Board of SARAS), Álvaro Soutullo (University of the Republic, Uruguay - Member of the Board of Directors of SARAS), Esteban Jobbágy ( National University of San Luis, Argentina - Member of the Advisory Board of SARAS) and Albert Norström (Executive Director of PECS, based in the Resilience Center of Stockholm). Later, there will be a Science-Policy Dialogue Table to discuss the main challenges and opportunities in ecosystem services management in Uruguay. The participants will be representatives of different divisions of the Ministry of Housing, Territorial Planning and Environment (MVOTMA, Uruguay), Ministry of Livestock, Agriculture and Fisheries (MGAP, Uruguay), National Institute of Agricultural Research (INIA), SARAS Institute, University of the Republic (Udelar) and civil society organizations. The 8th SARAS 2018 Public Conference is co-organized by CURE-Udelar, Stockholm University, Stockholm Resilience Center (SRC), and the PECS Program. It is supported by the National Environment Directorate of the Government of Uruguay (DINAMA-MVOTMA), the Sectoral Commission for Scientific Research (CSIC-Udelar) and the Development Program of Basic Sciences (PEDEClBA). It is sponsored by the Ministry of Education and Culture of Uruguay (declaration of cultural interest), the National Commission of Uruguay for UNESCO (Organization of the United Nations for Education, Science and Culture) and Sodre National Auditorium. The conference can be followed live through SARAS Institute website, in the speaker’s native language, which will mainly be in Spanish. Please find the conference agenda attached.